There are a lot of good anglers out there who know a load more than I ever will, but putting this knowledge down on paper in a way that is easy to understand and very accessible is a skill in its own right. Marc is not only a very good angler and now guide, but he also has this ability to think deeply about what he does and importantly as well what he sees when he is out fishing and guiding - and then he has the ability to put that information down on paper to create this hugely impressive lure fishing book. So let me ask you a question - how much would you spend on a single fishing lure, and would that lure give you a wealth of information about how to go about catching bass on lures? If you read Marc’s book and don’t learn a whole heap about lure fishing for bass then I’d say one of two things - either you know it all and are therefore an expert already, or else you can’t read. Seriously, I like to think I am okay at fishing and I am very happy to accept that I have lots to learn and that there are plenty of better anglers out there than me, but I’ve been doing it a while and I’ve got a fair bit of experience I suppose - holy cow though when I read The Lure of the Bass by Marc Cowling I am left kinda gobsmacked by how much he knows and analyses, and how much what Marc has written teaches me, and perhaps more importantly, gets me thinking about my own fishing and how I might mix things up. I love writing about fishing, but I honestly don’t think I have Marc’s ability to break the actual fishing down into such detail. Furthermore, I have broken down the chapters (below) so that the contents of the book gradually build on, or expand, on each facet related to this wonderful way if catching one the UK’s premier sporting sea fish. How to minimise your expenditure and maximise your time in relation to purchasing the right lure rod (I break down the components separately including the length, weight, power, action, etc) and the reel (line capacity, size, retrieve ratio) for you, in addition to the clothing required, mainline/leader and the miscellaneous items (lure clips etc.). How to ensure that each lure type you purchase completes a specific job for you in relation the shape, size, colour and movement and what it potentially represents in regards to the prey bass feed upon. The lure types are broken down into shallow, medium and deep diving floating minnows, weedless soft plastics, surface lures, paddle tails and sinking/suspending lures. Understanding how bass traverse the coastline and how to identify potential patrolling routes and positioning points is vital to your chances of success. Plus, how do you take advantage of the fearsome, opportunistic and predatory instincts of a bass. What constitutes as a potential bass mark or likely venue – how do you ‘read’ the ground when the tide has retreated or when you’re looking at an image on Google Earth or a photograph. Once you own the appropriate equipment and lures, understand the overall behaviour of bass and you’re confident about the marks you have discovered, how do you go about ascertaining if they are even present? This chapter offers a suggestion as to which naturally occurring elements to record (tidal range, state of tide, water clarity, etc.) and how to collate them so that you can identify patterns in activity from your results. I offer a very detailed insight into my personal diary entries, the conclusions I have come to make and my overall experiences and the quantified catch rate within certain parameters. Ultimately, if you are armed with as much information as possible about deciding where and when to fish you will be increasing the odds significantly in your favour. Deciding which lure to use over another when faced with the multitude of sea and weather conditions you’re likely to face is something my clients (more than anything) want to learn. Moreover, you can be in the right place at the right time, but that lure still needs to look and act like something bass are looking for via the angler retrieving or ‘working it’ in the correct manner. 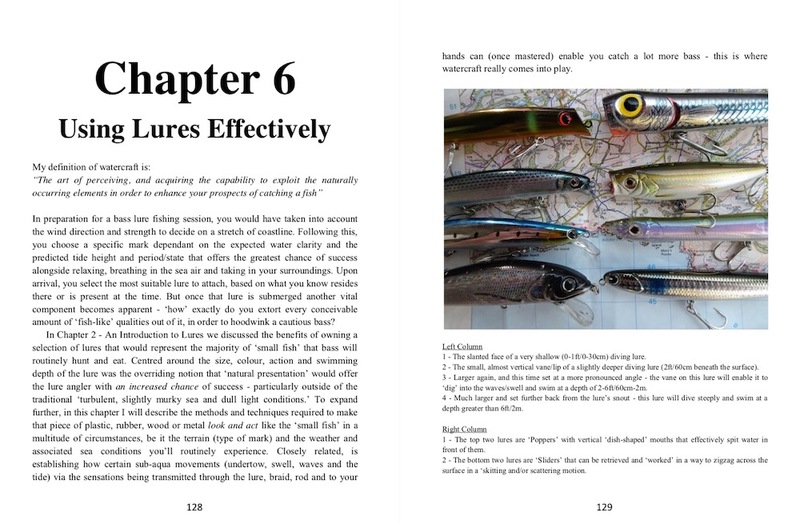 This chapter tells you ‘how’ to use lures effectively alongside capitalising on, and exploiting the elements to your advantage in pursuit if these wild and wily creatures. How to identify the marks, which lures to choose and how to use them, in addition to how state of tide, tidal range and light levels can affect your results. Again, I offer a unique insight into my own catches and that of my guided clients within an approach that has been a total game-changer. I really like how this book is very much not a preachy kind of gospel that says there is only one way to go about catching bass on lures - to which I have always said balls, and because I know and respect Marc, I know that he genuinely feels the same way. Big respect Marc, holy cow “The Lure of the Bass” is one hell of an accomplishment and I urge you to buy a copy if you have an interest in catching more bass on lures - which you can do so right here. For less than the price of many hard lures you are getting something which will help you catch a lot more bass. And of course I can’t leave you for the weekend without expressing my hope that Ireland might choke in Dublin on Saturday afternoon and by some miracle we might actually find our best team before the World Cup later this year. I am very worried that a positive result (from an England point of view) to both those points might be as likely as seeing a leprechaun in the flesh, but I am led to believe that multiple pints of the black stuff down in Kerry especially often results in leprechaun sightings, so miracles might actually be possible. I honestly can’t take the level of abuse that will no doubt be dealt out to me if we don’t come away with a win on Saturday, so please, please, please England let’s turn the Irish over……………..